Students will be able to solve Easter addition and subtraction word problems using drawings and writing equations. Tell students that the Easter Bunny has six blue eggs, six red eggs, and seven green eggs. Ask the students how many eggs the Easter bunny has altogether. Explain that in order to solve this kind of math problem, called a word problem, we will need to keep track of each number of items. Demonstrate how to find the three numbers and write the addition equation 6 + 6 + 7 = ____ on the board. Model drawing pictures to represent each number. Have students count aloud with you the drawings together. Show how you can also add 6 + 6 (if students know that equals 12) and then add seven to find the sum. Ask the class how this problem is different and similar to the last problem. If needed, clarify that this is a subtraction problem, not an addition problem. Have the students help you solve the problem by writing the subtraction equation 15 - 4 =____ and by drawing 15 jelly beans on the board. Ask a student to come up and show the class how they could find the difference. Answer questions or clarify as needed. Explain to students that they will now solve addition and subtraction word problems on their own. Remind them to write their equations and use drawings as they solve each problem. Gather a small group of students to complete the worksheet together. Allow students to use the cut out the egg shapes you made to use as they solve each word problem. Have students complete Easter Word Problems #2 and Easter Word Problems #3 if they finish early. Collect student work and check if students were able to accurately depict the word problems using addition and subtraction equations and drawings. Gather students back together and say, “Help! The Easter Bunny started out with nine eggs. Then the Easter Bunny found eight more eggs in the forest. How many eggs does the Easter Bunny have now?" Ask students to help you write the addition equation and draw pictures to solve the problem. Get your child to celebrate Easter with word problem fun. Easter word problems get your child to find the amount of candy Bobby gets and eggs Andrea finds. In this Easter-themed lesson, students will get to practice their reading and math skills as they figure out how to write equations and solve addition and subtraction word problems. Hunt for the solutions in these Easter word problems! Kids will practice reading as they work out these addition and subtraction problems. Here are some sweet Easter problems to keep your child busy this holiday! He'll put his reading skills to the test to solve these word problems. Get ready for Easter! These colorful word problems will get your child in the mood for this spring holiday as he practices basic math. 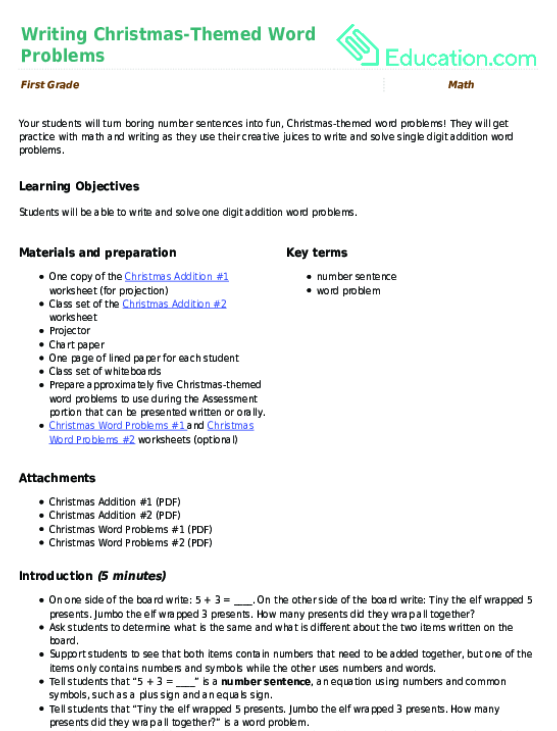 Your students will turn boring number sentences into fun, Christmas-themed word problems!